Asset Guardian Solutions Limited are proud to be the official sponsors of the talented Shotts and Dykehead Caledonia Pipe band who are set to take on the 2018 World Pipe Band Championships in Glasgow this weekend. 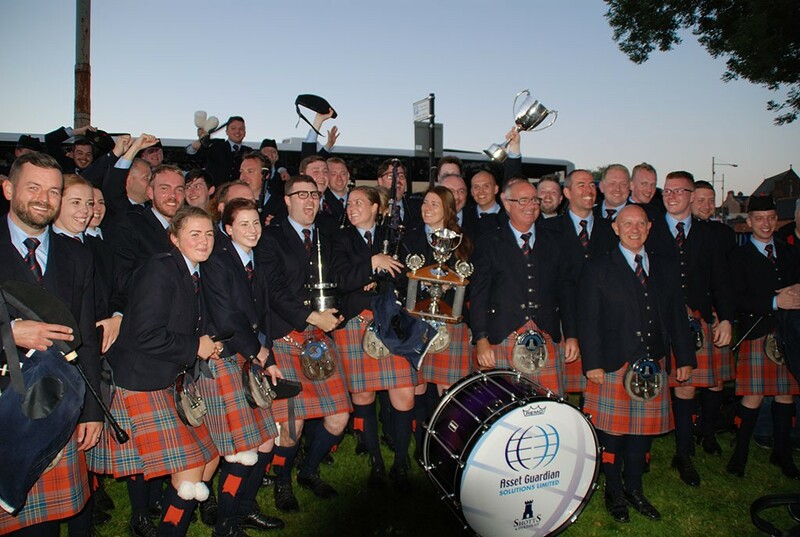 The band who are who are 2015 World Champions, and 16-time winners of the RSPBA World Pipe Band Championships are one of the most successful pipe bands in history. The band is led by Pipe Major Ryan Canning and Drum Major Andrew Lawson and is in it’s 107th year. During this time, it has celebrated over 100 RSPBA Major Championships. The event will take place on the 17th and 18th August 2018 at Glasgow Green, and will see 214 bands from 13 countries compete against each other. From everyone at AGSL, we would like to wish the band the very best of luck for this weekend, and hope they can bring the trophy back this year!